The Republic of Uzbekistan, as other former Soviet countries, celebrates its Independence Day. This holiday annually falls on September 1. Uzbekistan became a part of the Russian Empire in the 19th century, when it began to expand to Central Asia. Although the nations of the Central Asia resisted it, the countries became a part of the Soviet Union. In 1924 the Uzbek Soviet Socialist Republic was created with the capital in Samarkand. The capital was moved to Tashkent in 1930. The republic had a chance to declare independence after the failure of the Soviet coup attempt in Moscow in 1991. Counties within the Soviet Union one by one started to declare their independence, authorities of Uzbekistan did it on August 31, 1991. This event laid foundation for celebration of Independence Day. Although the country de facto gained independence in August, the celebrations are held on the next day, on September 1. 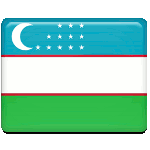 After declaration of independence the Republic of Uzbekistan adopted the state flag and a new constitution.